The Federal Reserve meets during the first week of November to decide whether or not to increase interest rates. The probability of a rate hike in November stands at only 8.8% while increasing to 63.3% at the December meeting. With the elevated likelihood of an interest rate hike before year end, income focused investments, both fixed income and bond like equities, are adjusting to this potential outcome. 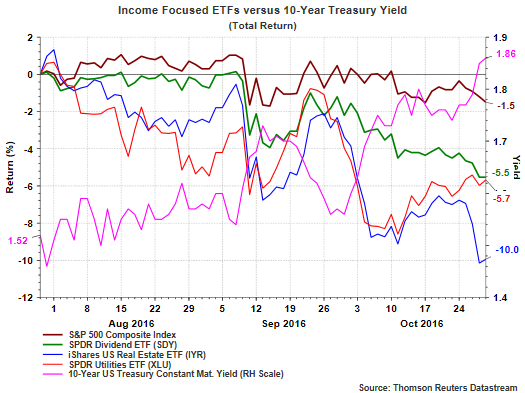 As can be seen in the above chart, over the last three months, the yield on the 10-year Treasury has increased over 30 basis points while a few selected income focused ETFs are down five percent or more, with REITs (IYR) down 10%. 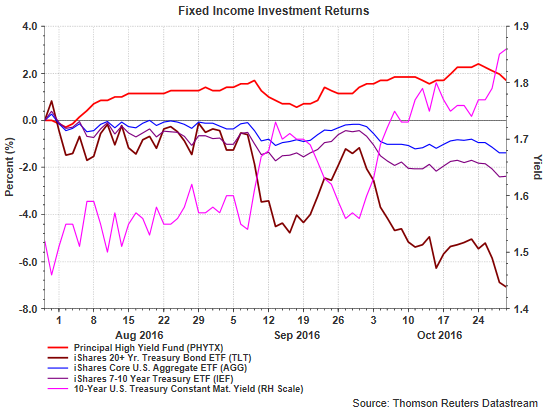 The same return outcome is occurring with some fixed income investments. As the below chart also shows, bond investments are adjusting to a potentially higher interest rate environment as well. Longer term bonds, as represented by the iShares 20+ Year Treasury ETF (TLT), have fared worse than bonds of a shorter maturity and is down over 7%. A Fed rate increase before year end is not a certainty; however, with market rates adjusting to a higher level, bond like equities and longer term bonds remain under pressure. As of the end of the second quarter the U.S. government's budget deficit is once again widening and stands at $664 billion compared to $543 billion at the end of 2015. As can be seen in the below chart, government outlays as a percentage of GDP equals 22.4% and above the long run average of 20.3%. Additionally, government revenue as a percentage of GDP equals 18.8% versus the long run average of 17.7%. The gap is real but the percentages are elevated due to the continued weak growth of the economy in this recent expansion and hence the below trend GDP level. 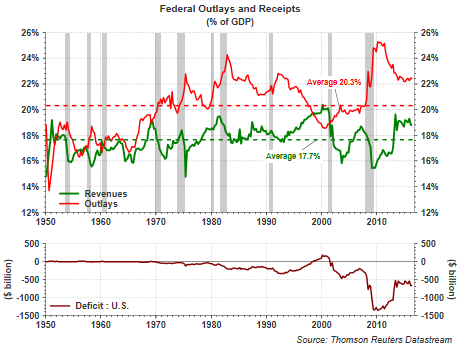 In absolute dollar terms, the deficit has widened in spite of record tax receipts/revenue collected by the government. The below chart shows revenue is up 30% since just before the the start of the last recession. 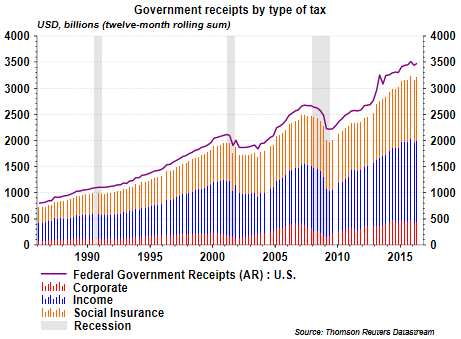 Government receipts have increased from $2.669 trillion to $3.472 trillion. At the same time, government expenses have increased at a far faster pace, up 39% over the same time period to $4.137 trillion from $2.979 trillion. A significant issue with government expenditures is the high level of non-discretionary items. Additionally, net interest expense stands at $248 billion, 6% of the budget. If the recent move in interest rates is any indication of future interest expense on the government's debt, the budget deficit will likely continue to widen without implementation of policies that are pro-economic growth. Since July 6, the yield on the 10-year Treasury has increased 53 basis points from 1.32% to 1.85%. As new debt is issued to fund the deficit, these higher interest rates will be problematic for the government's budget. 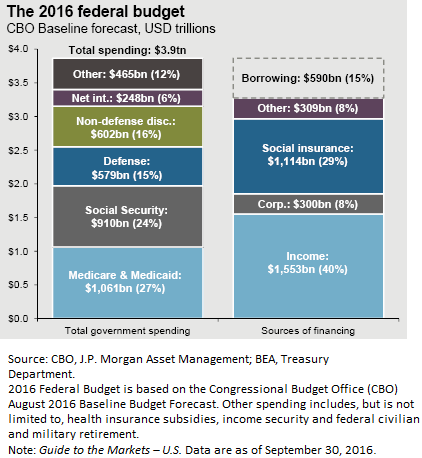 Aside from interest on the government debt, explosive growth in entitlement spending will need to be addressed in order to bring discipline to the government's budget as well. Rhetoric that the middle class will not be impacted by tax hikes is just that, rhetoric. It was recently announced that wages subject to the social security tax will increase from $118,500 this year to $127,200 in 2017, a 7.3% increase and thus directly impacting the middle class tax payer. There are no easy solutions to addressing the government's budget deficit, but addressing this sooner versus later can ease any potential pain. In our recent published Fall 2016 Investor Letter, our commentary covers recent market related events, U.S. earnings, interest rates and the pending election. Emotions tend to run high during these times creating an environment that can drive investors to reduce their stock market exposure. The newsletter discusses the consequences these decisions can have on long-term returns. In our Summer 2016 Investor Letter, we highlighted our positive view on U.S. equities, supported by an anticipated resumption in earnings growth for the second half of 2016 and into 2017. Although analysts expect companies in the S&P 500 Index to report a slight drop in quarterly earnings for the third quarter, we believe reported earnings will turn positive in the quarter and discuss this in the Investor Letter. For additional insight into our views for the market and economy, see our Investor Letter accessible at the below link. One factor that has turned into 'normal' for this economic recovery is its slow rate of growth. Out of the eleven recoveries since 1949, the current one is the slowest, barely averaging above 2%. 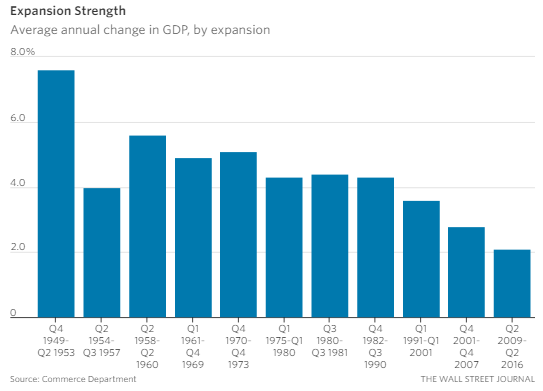 This slow rate of growth has left a gap in potential economic output of nearly $3 billion. 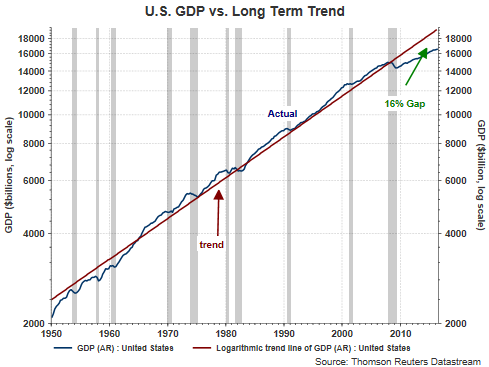 In percentage terms the economy's slow rate of growth has expanded 16% below its long run potential. This missed potential output has resulted in a weak labor market where individuals have been unable to find jobs, many simply dropping out of the labor force. The increase in those not in the labor force has resulted in a decline in the participation rate. The participation rate refers to the number of individuals over the age of sixteen who are either employed or are actively looking for work compared to the overall civilian population. The latest participation rate equals 62.8%. Prior to the financial crisis, the March 2008 participation rate equaled 66.1%. This fall in the participation rate has created a gap of 8 million people that are not employed. 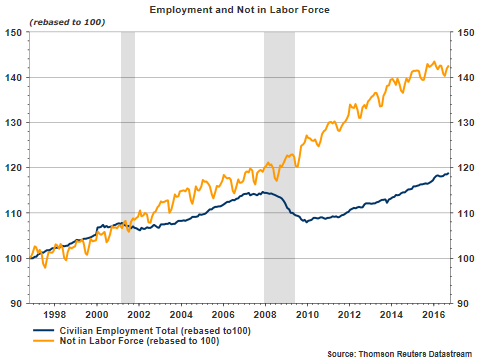 A result of these fewer employed individuals is an increase in those not in labor force as can be seen in the below chart. Since March 2008 the rate of growth in the 'not in labor force' category has steepened with total employment growing at a slower pace. 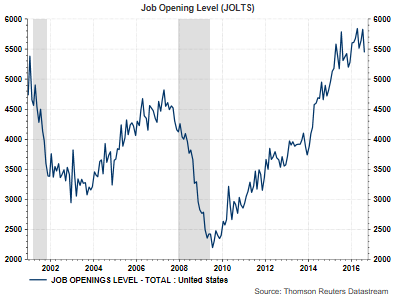 The factors contributing to this drop in the participation rate is not completely clear, but the monthly Bureau of Labor Statistics Job Openings and Labor Turnover report shows job openings are at their highest level in fifteen years, 5.4 million job openings. A part of the drop in the participation rate is likely attributable to a mismatch between the available jobs and the skills of job seekers. This slower rate of GDP growth puts the Fed in a predicament as to the timing of the next Fed interest rate increase if job creation is of concern to the committee. Janet Yellen stated after the September Fed meeting that she believes the job market is returning to health due to an uptick in the participation rate. 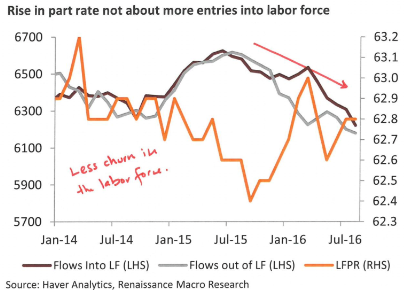 However, in a recent Fortune article, Neil Dutta, Chief Economist with Renaissance Macro Research points out, "if you look at the actual flow data showing the number of people each month entering and exiting the labor force, the rate at which workers are entering the labor force is actually lower today than at any point over the last two years." With the probability of a rate hike in November at less than 10% and odds just under 70% in December, the market seems to be expecting a rate increase before the end of the year. Although a 25 basis point rate increase from this low level of interest rates likely does not cause an economic shock, the current slow pace of economic growth is a factor that needs to be considered. A quickening pace of GDP growth does not seem on the horizon either. 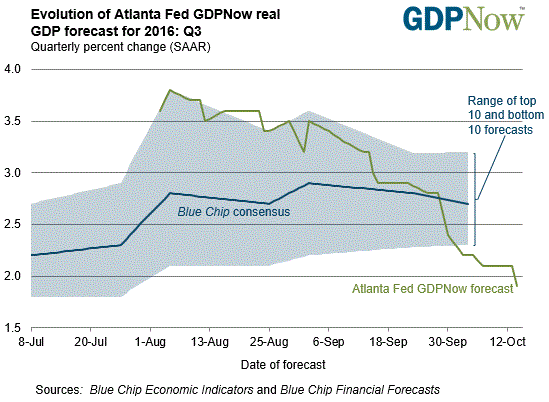 The Atlanta Federal Reserve uses data to create a more current estimate of GDP growth called GDPNow and last week they lowered their third quarter forecast down to 1.9% from a prior estimate of 2.1%. In conclusion, with the economy seeming to continue to grow at only a snails pace and a labor market that is really not overheating, a Fed rate increase before year end would likely not contribute to improve the pace of hiring. 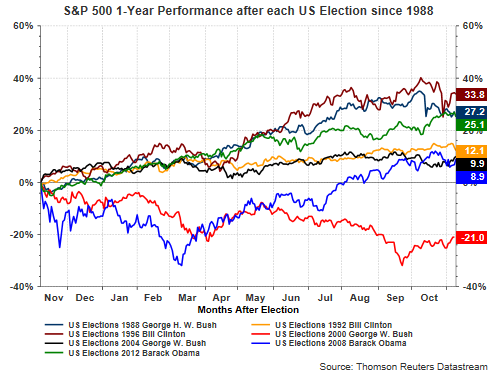 Absent an election year, equity markets generally trend higher until the seasonally weak September/October months. However, during an election year, equity market weakness tends to occur during the summer months and subside as the November election draws near. 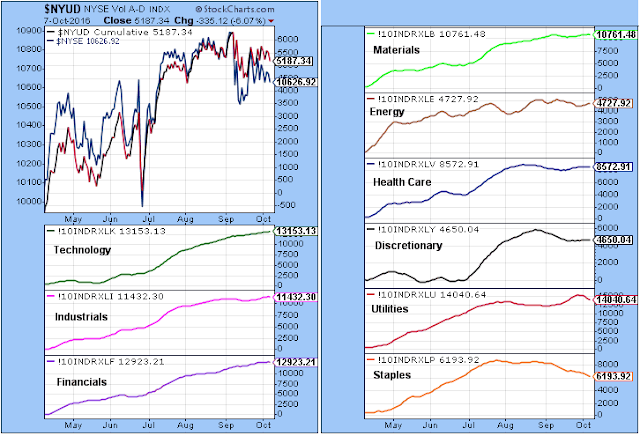 Historically, markets then rally into year-end. The market has followed this pattern so far this election year. As the below chart shows, when reviewing each November election dating back to 1988, the S&P 500 Index’s performance for the following 1-year is positive 7 out of 8 times. The only negative period was during the bursting of the tech bubble in 2001. This election year certainly seems to be a very polarizing one. The newly elected President will need to tackle many policy issues: foreign policy, foreign trade, U.S. deficits, student loans, health care, global terrorism and defense, immigration, individual and corporate tax reform, just to name a few issues. We would, however, reiterate what we wrote in our Spring 2016 Investor Letter. We believe a President can exert significant influence over a specific industry (the Obama presidency and the impact on health care and coal), but, he/she has limited influence on the overall direction of the broader market. So as election day draws closer, the uncertainty of the outcome will clear; thus, potentially, paving the way for higher equity prices into next year. Since mid August the S&P 500 Index was down approximately 3% to mid September, but has recovered about 1.3% to Friday's close. 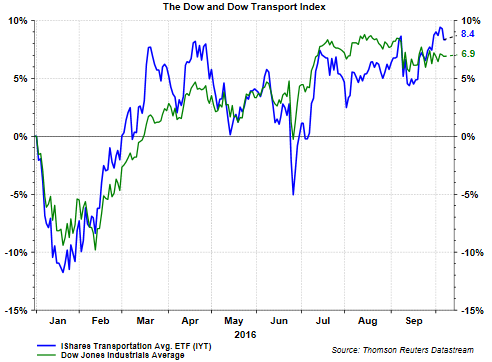 The market seems to be having difficulty finding direction, trading mostly sideways since mid July, as can be seen in the below chart that includes the transport index as well. As I noted in a post in early September, transports began outperforming the S&P 500 Index at that time after trailing the broader market for most of the second quarter. When the transports begin to lag the broader market there is some belief this is potentially a precursor to a weakening economy that leads to a decline in the S&P 500 Index. As the above chart shows though, transports appear to be in decent shape, potentially pulling the S&P 500 up with it on improving economic fundamentals. 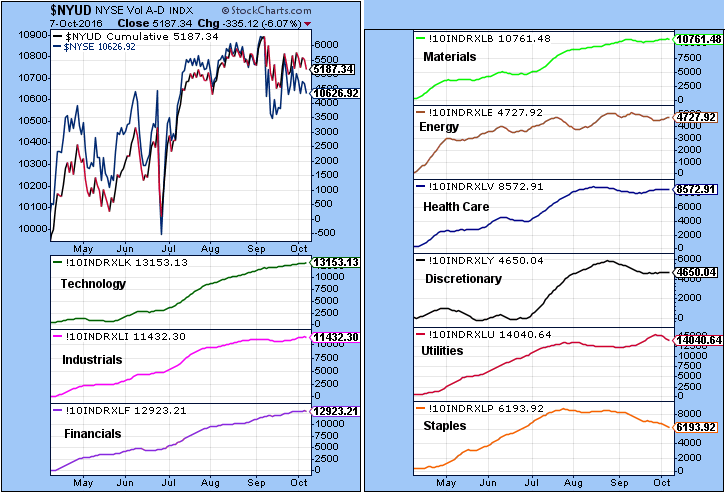 A part of what seems to be occurring in the broader market is a rotation out of the income and defensive sectors. In looking at sector returns since the beginning of the year (blue bars) and returns since the end of June (yellow bars), the weakest part of the market since the end of the second quarter has been health care, staples, REITs and utilities. 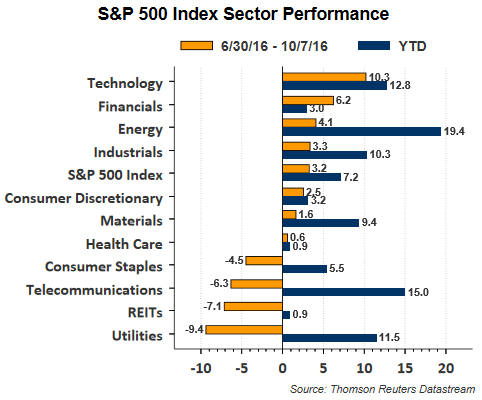 The top performing sectors since June are the more economically sensitive ones, technology, financials, energy and industrials. I have discussed in earlier posts about the likelihood of the coming end of the earnings recession in Q3. Aggregate 'as reported earnings' for the S&P have already increased for three consecutive quarters. This rotation out of the defensive/income sectors is also showing up in the downtrend in the advance decline lines for the defensive/income sectors. A part of the flow out of dividend yielding stocks is the anticipation of a Fed rate hike before year-end. 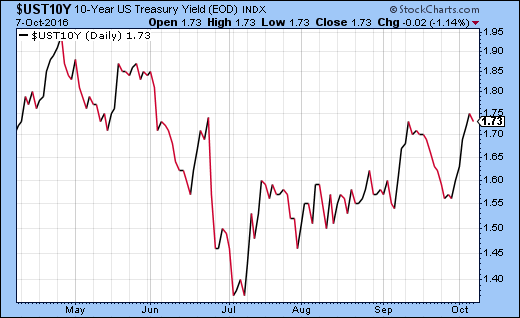 The 10-year Treasury yield has already moved higher from a yield of 1.32% in July to 1.73% at Friday's close. Higher interest rates tend to result in the price of dividend yielding stocks, bond like equities as some call them in this low rate environment, to fall. This has been the case with the bottom performing income oriented sectors. The price decline has been relatively quick as can be seen in the below chart of the utility sector. "Overall, the probabilities still favor a bullish breakout to higher highs. Why is that? The combination of both the short and long-term bullish plays that remain in motion. The longer-term double bottom breakout play targeting S&P 2365 remains in play. While price has seemingly stalled out over the past seven weeks, there has not been any significant roll back either other than the -3% throwback retest last month that successfully tested and held support. All that is needed now is to take out the August highs and start acquiring the numerous bullish target objectives." All else being equal, I believe the earnings recession should end this quarter (energy is a wild card and key) and the sideways market action is partly due to sector rotation. As more certainty is established about the election outcome and the Fed rate decision, equities could see a move higher into year end. At the end of September our research led us to sell Tyson Foods (TSN) common stock in our client accounts. Our firm relies heavily on fundamental research in our stock research in order to uncover buy and sell opportunities for our clients' portfolios. What led us to our sell decision was not the direct reason TSN was down nearly 9% on Friday, but an indirect one. As background, our firm added TSN to client accounts in May of 2015 following the stock's decline as a result of bird flu showing up in poultry in Arkansas where Tyson has poultry operations. In short, we felt the bird flu issue was a temporary one and that TSN would recover from this issue. Additionally, we expected TSN to benefit from its acquisition of Hillshire Foods that had closed in August 2014. The acquisition benefits materialized, the bird flu situation passed, and TSN's stock price recovered nicely. After our initial decision to purchase TSN on May 14, 2015 at $41.76, we trimmed the holding on May 19, 2016 at $64.88, a 55% gain after one year. One of our risk control disciplines takes into account position size and this was one of the reasons for trimming the holding in May. We sold the remaining TSN position on September 30 at a price of $74.52 and the sell was made for fundamental reasons. Tyson's stock is not necessarily trading at an extended valuation, 18 times earnings at the time of our sell, when compared to the overall market. Additionally, the earnings growth rate for Tyson in the later part of 2015 and through September of 2016 has been strong. As the below snapshot of earnings shows, YOY growth ranged from 49.4% to 51.3% in Q3 2016. Fourth quarter (9/30/2016) is expected to see YOY growth of 33.5%. Beginning in the December quarter though, YOY earnings growth is expected to decline to single digits, 7.1%. Further, without share buybacks, the YOY earnings growth rate would equal only 2.6%. Therein lies our issue with the stock. Tyson is a good company, but the company's stock price seems to have gotten ahead of earnings growth fundamentals at least near term. One factor that tends to serve as a headwind for stocks is when the growth rate of earnings is slowing over time, especially after being strong for an extended period of time historically. In this slowing earnings growth environment, often times a stock's valuation will adjust to account for the slowing earnings growth rate. This adjustment can occur either over time by trading sideways or can adjust in price be some decline in the stock's price. This leads me back to the 9% decline in TSN's stock price on Friday. The decline was in response to a research report released by Pivotal Research Group. In the report Pivotal indicated there might be price fixing issues related to broiler chickens. The report's conclusion is related to a class action complaint filed on September 2nd, Maplevale Farms, Inc. v. Koch Foods, Inc. et al, According to Pivotal, "The complaint alleges that Tyson, together with Koch Foods and multiple other players in the broiler chicken business, systematically colluded to reduce production of broilers since about 2008. The mechanism for collusion is not a shady meeting in a hotel room, as was once done by players in the lysine market. Rather, the complaint alleges supply collusion occurred through nonpublic data exchange; detailed industry reports compiled on a daily or weekly basis by Agri Stats, Inc., a subsidiary of Eli Lilly and Co., and then sold back to industry participants." In conclusion, all else being equal, at the time of our last sell of TSN, we believed the company's stock valuation needed to decline to a mid to low double digit P/E multiple given the slowing earnings growth rate. With Pivotal highlighting the recent class action lawsuit, this to could have a negative impact on TSN margins and future earnings growth. As a result TSN's stock price has and is adjusting to a P/E multiple that is more in line with the anticipated growth rate of TSN earnings. For investors, when earnings growth of a company slows from over a 40% growth rate to single digits, a stock's price will often adjust downward to account for this slowdown. On top of this, when secondary news like the above noted class action lawsuit comes out, a stock priced for perfection can decline sharply, as was the case for TSN Friday. Last week S&P Dow Jones Indices reported preliminary aggregate data on buybacks, dividends and earnings for the quarter ending June 30, 2016. Of note in the second quarter is buybacks declined 21% versus Q1 2016 and down 3.1% versus Q2 2015. Importantly, as reported earnings increased for the third consecutive quarter increasing to $201.79 billion versus $189.37 billion in Q1 2016. Dividends of $98.3 billion represented a 4.1% increase versus Q2 2015. Year over year dividend growth has remained positive since June 2010, although growth has slowed to a mid single digit growth rate. Cash reserves also set a new record for the second consecutive quarter, as S&P 500 Industrial (Old), which consists of the S&P 500 less Financials, Transportations and Utilities, available cash and equivalent now stands at $1.374 trillion, up 2.0% from the prior record of $1.348 trillion. The current cash level is 86 weeks of expected 2016 operating income (the same as was posted for Q1 2016), giving corporations leeway in their expenditures. “Shareholder returns continue to be strong, even as the quarter ticked down from last quarter’s record, Cash has increased to a record, as low-cost financing globally remains plentiful." 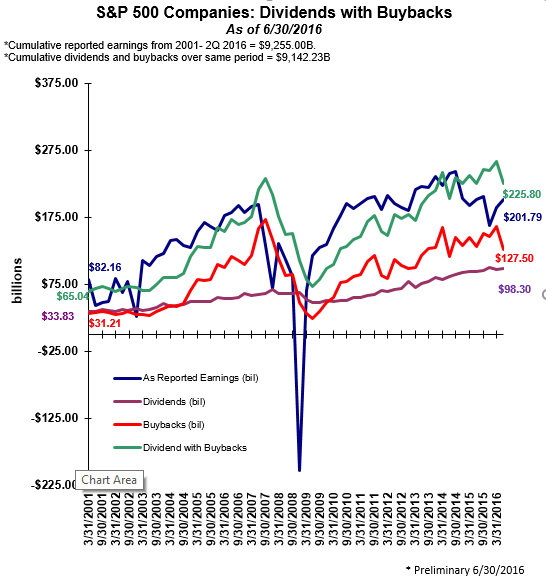 As I have noted in recent posts, an earnings recovery seems to be unfolding. Increasingly, more data continues to point to this earnings recovery over the course of the next twelve months. On Friday, the Economic Cycle Research Institute released data on its proprietary Weekly Leading Index. A variation of this same index is the Leading Growth Index (WLIg). As the following chart shows, the WLIg turned positive in March. 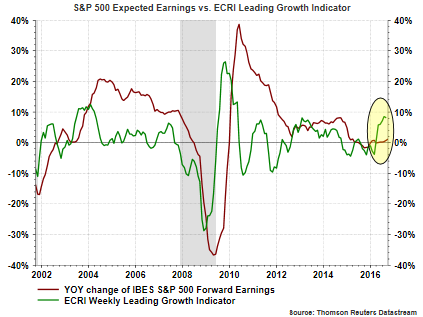 Importantly, earnings growth tends to follow changes in the WLIg and recent positive equity market returns may be anticipating an improvement in both the economy and earnings. Two variables that led to the earnings headwinds in 2015 were the strong U.S. Dollar and the contraction in oil prices, both of which had a negative impact on a number of sectors in the economy. Brent Crude equaled $36 per barrel at the end of 2015 and closed in September at $46 per barrel. Oil prices are likely to remain volatile; however, OPEC’s announcement at the end of September of a production cap (cut) provides some desire by OPEC to see some balance in the supply and demand for oil. This potential balance will be favorable for companies exposed to the energy sector of the economy. As a caution though, in the early 1980’s, OPEX cut supply and then saw oil prices fall 40% as other producers increased supply in order to capture market share. In fact, a similar dynamic could play out this time as the Baker Hughes rig count has increased from 408 in May to 481 in August.